During presentations recently, and seeing more and more incidents where our responders have been struck across the country, I ask myself over and over, where is the outcry? A good friend of mine, Dave Corp, a Law Enforcement Liaison for the Kansas Department of Transportation, talked about this at responder training classes in Kansas recently. If these injuries and deaths were the result of shootings, house fires, or other incidents that we respond to, there would be outcry. But these are “just traffic” incidents. This brings me to another question. What role should risk management providers and administrators have in TIM? When I worked in city and state government we were reminded regularly by risk management of the dangers of the jobs. There were training sessions for different hazards that we might encounter, and suggestions on how to minimize any injuries resulting from these hazards. One of the most heavily covered topics in these training sessions was the importance of using all required Personal Protective Equipment (PPE). As a supervisor, I received extensive training in the supervision of personnel. This training also discussed the importance and need to use all required PPE. There was discussion of the law covering Workman’s Compensation claims. In most states, there is a clause in Work Comp law that explains that benefits may be reduced or eliminated for willfully failing to use PPE that is provided by an employer. Another thing that I received training in, both in supervision classes and in risk management training, was the consequences of failing to properly supervise personnel. When you take on the role of supervisor you also take on the responsibility of making sure that personnel assigned to you follow all agency rules, regulations, general orders, policies, procedures, etc. This requires that supervisors actively supervise and make sure that their personnel are complying. Failing to properly supervise can result in the supervisor being placed in a position of liability when something bad happens. I use this photograph when teaching responder training classes. I explain that the photo has obviously been photo-shopped with the cape, but it shows a police officer standing in the middle of an interstate highway with no high visibility clothing. At this point I tell the students that personnel should not expose themselves to the dangers of traffic like this, and I emphasize that supervisors should never allow this. But, things just like this continue to happen. For TIM programs to be successful, to minimize the exposure of our personnel to traffic, to reduce the needless injuries and deaths to our personnel, and to minimize the impact that traffic incidents have on the lives of all roadway users we need leaders to step up and take charge. We need champions for our personnel. These must be champions of doing the right thing, for the right reason. Being a champion for TIM is just a part of doing the right things. In my presentations, I often ask those in attendance how many of them consider themselves leaders. I then ask those if they had looked over their shoulder recently. Is anyone following? And if you are truly leading, are you setting the example that you want for your personnel? If there isn’t anyone following, maybe it is time to reconsider priorities and make sure that you are doing the right things. I don’t want anyone to think that I want to see personnel disciplined, or that I want to see anyone lose benefits because of incidents that occur as a part of their job. That could not be further from the truth. What I want is for everyone to have a long, rewarding career in the field of their choice, one free of injury. I want all responders to go home at night. I don’t want anyone to have to deliver the messages that I have had to deliver to surviving family members. My guidance to my personnel has always been, “Do the right thing. And, you all know what the right things are”. Anyway, this all started with the role of risk management in TIM. I know that we will all be hearing from risk management providers and administrators as we move forward in our careers in TIM. I think that it would be better to hear that we are doing the right things. As a reminder, there are several noteworthy events in the next few weeks that honor responders. Please take the time to recognize all the responders you work with and let them know you care. 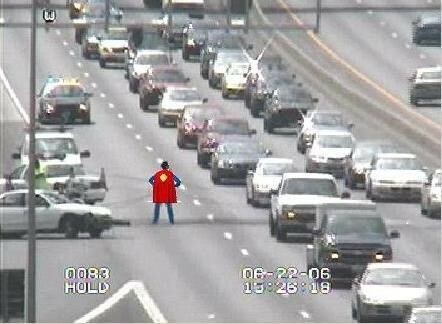 With gas prices staying low I know that there will be more people than ever traveling on our highways. This means that there will be more chances for incidents that expose our personnel to the dangers of traffic. Be cautious in your travels. Don’t let yourself be one of the distracted drivers that we know are so dangerous for our personnel. Stay safe and be sure to tell those you care about how important they are to you. On May 18, 2017, 2:30-3:30, FHWA Office of Operations is conducting a SHRP2 TIM Training webinar in partnership with the Towing and Recovery Association of America (TRAA). The webinar is being hosted by the National Operations Center of Excellence (NOCoE) and speaker presentations include TRAA President Jeff Roskopf, and TRAA Executive Director Cynthia Martineau, the Virginia Department of Transportation’s Operations Division Administrator, Dean Gustafson and Connecticut Department of Transportation TIM Program Project Manager, Paul Krisavage. Don’t miss out on this important webinar specific to Towing & Recovery Traffic Incident Management training implementation, best practices, legislation and more. See attached webinar announcement for registration details and please spread the word to your State TIM partners. See below for a copy of the “TIM Trend” newsletter from Oregon! Glendale, Arizona’s Regional Public Safety Training Center just turned a decade old! Check out the link below for more details on the training center. 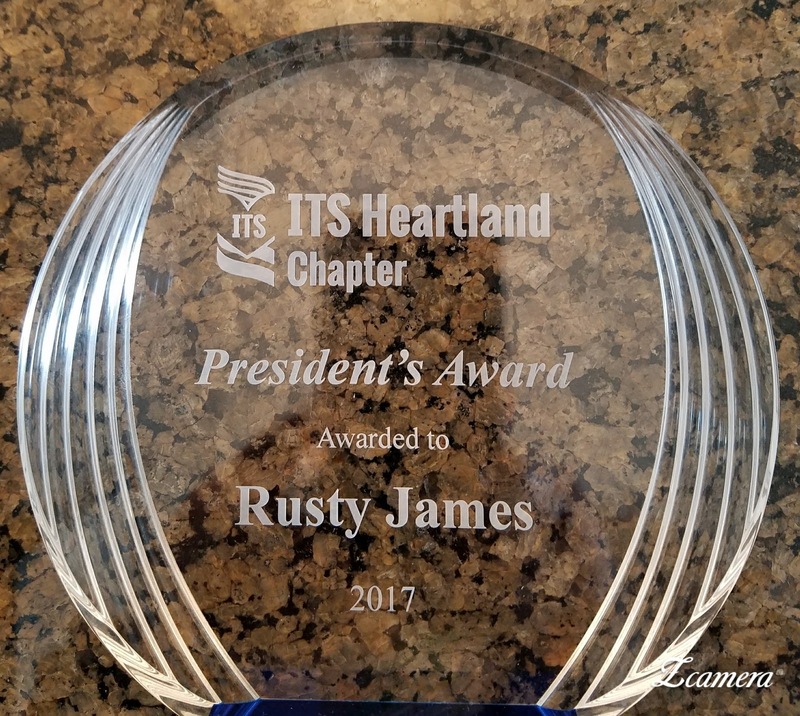 Rusty James has worked with ITS Heartland for many years providing training to the membership, and another perspective for the advancement of ITS. For the last 3 years, Rusty has served as a Consultant Director on the Board for the organization. 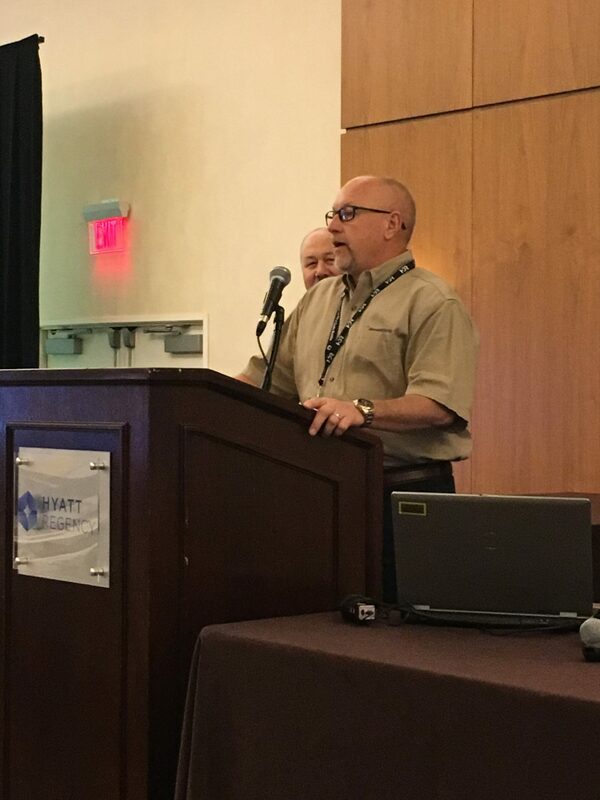 This year Rusty stepped down from that role and passed it on to Slade Engstrom from TranSystems. Slade works with the Kansas Department of Transportation, managing the contract with WichWay, the TMC in Wichita, Kansas. 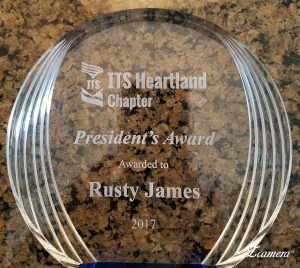 At the annual meeting, Rusty won the President’s Award by ITS Heartland. This award is not given yearly, and is only given to those who make significant contributions in ITS. This is quite an accomplishment for someone whose background is in law enforcement, not in the engineering field. Rusty was surprised by the award. He told those at the meeting that it was truly honor to receive an award from ITS Heartland, and from those whom he respects so much. Rusty encouraged everyone to keep pushing forward as the future of transportation is in Operations. He stressed the importance of promoting the benefits of ITS, and the roles that everyone serves, as much as possible.